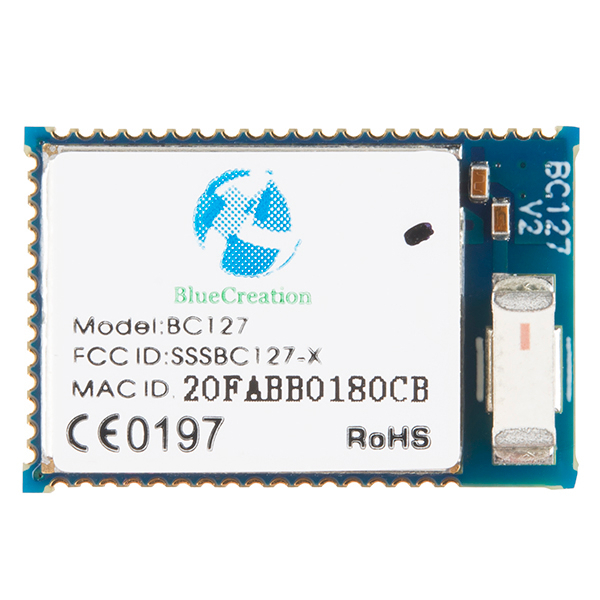 "The issue ended up being that the newest firmware for the BC127 module (6.0.37) has a new set of commands. And several of the v5 firmware commands are no longer valid. I had updated the firmware on both modules before I started testing." Can you connect multiple masters to this? Can I connect my phone and my friends phone, and either of us can play music? Not at the same time, of course. But will it support multiple connections? Is it possible to hand solder this onto a PCB with an iron? It is possible but very difficult unless you're good at soldering fine pitch SMD parts. (The pins on this module are very small and close together.) 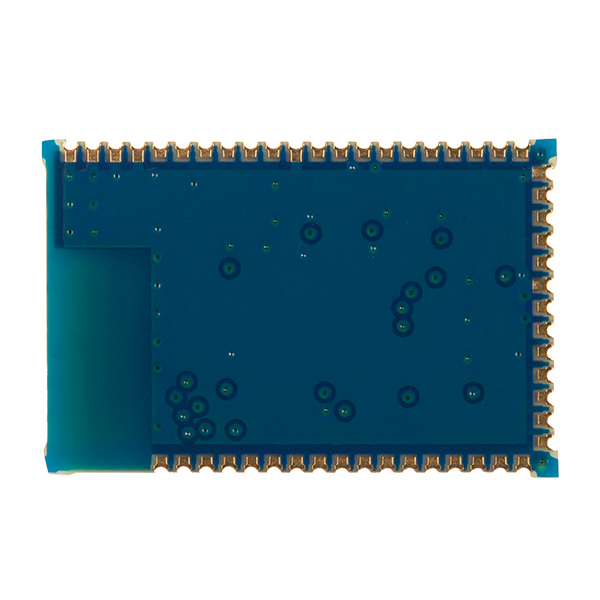 We have the same module on a breakout board that might be easier for you to use. Can I load code to this module and generate analogue signal? This is one versatile little device. I love it. I threw it into a senior design project for a portable headphone amplifier and it really works great. It retrieves meta-data for any media that is playing if you connect it to a phone and the audio quality is excellent! This price is also very comparable to the Digi-Key price. I would absolutely buy the Sparkfun jamboree for testing debugging before you embed this into a project. I love all the options this device offers! Thank you Sparkfun. Is there a fritzing file for the bc-127 SMD? If not, could SparkFun make one? I know there is one for the breakout, but it would be helpful to have just the SMD available in fritzing to create a custom pcb. This module have hardware codecs for MP3 and AAC. Can this module used (apart of bluetooth functionality) just for decoding of compressed audio? Hi all, I am an amateur radio buff trying to build a bidirectional bridge to add a wireless head set / mic to my mobile radios. AKA I need bidirectional audio support between 2 modules. I want to connect a off the shelf headset with boom mic to one module. The other to connect to mic input and mono audio out on a amateur radio. could these modules handle this? The ability to send a Push to talk sig from head set to radio would be a big plus as well. Question: I intend to use the I2S out from BC127 from the to connect to a separate hifi DAC of my choice. Can I access I2S do this directly without further configuration of the module? I would like to stream audio from my iphone to the remote DAC. I have one question.... having bought a breakout board, I have realized this is TINY! 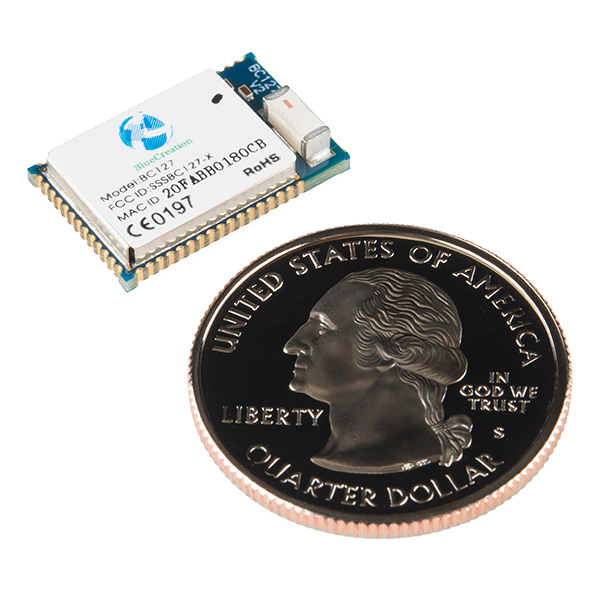 compared to bluegiga's ble112(which btw comes short to bc127).... how do I solder this to a prototype pcb? Pins are way too tight... anyone got any advice? Solder paste and a hot plate/griddle to reflow it. You should check out the SMD soldering tutorials too, you might be able to blob on a bunch of solder and then wick it off with solder wick. Can this be used with both 3.3V and 5V Arduinos (or other controllers)? Both a 3.3V and 5V Pro Mini are used in the hookup guide. The supply voltage in the BC127 datasheet is listed as 3.3V to 4.7V, so 5V should be fine, right? I wanted to ask because the RN-52 Bluetooth module that is also sold on a breakout board by Sparkfun is very specifically only a 3.3V chip, so I don't know how strict that is with this one. I am confused. I want to know, what is the minimal setup for the chip to broadcast a signal to a phone. If I connect VDD_PADS, VBAT to a 3.7V battery, should I use VREGEN, VCHG, VBAT_SENSE? Can I connect VDD_PADS directly to a battery, or do I need a 3.3V regulator? The schematic posted in the comments is for a much more complex setup than I want and I don't think I need to tie all of those pins to power, do I? Is there any other logic required? I can't get it to cycle on. It also helps to tie reset pin high with a 10 kOhm resistor. Correct! I got that info from the manufacturer, but forgot to come back to post the answer! If one had two of these could they communicate with each other? Yes. See this examples page, the module has SPP support. Is this module compatible with iPhones? In the datasheet there is a reference to BC127-A which offers connection to iOS. It is! 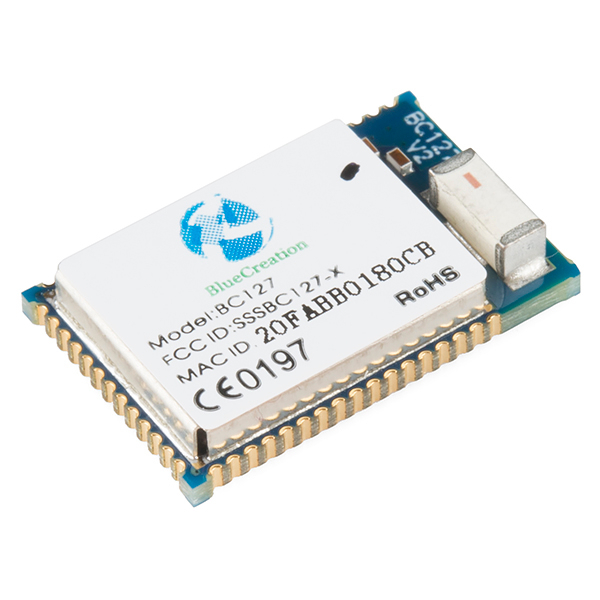 The BC127 supports IAP1/IAP2 profiles for connection to iOS devices. Perfectly working. Be aware when you open the connection with HFP profile ... Use "OPEN (ADDRESS) AG" instead of logical "OPEN (ADRESS) HFP"
This device is powerful, but as other users reported, lack of documentation make it difficult to get up and running. For basic functionality you can follow all of Sparkfun's tutorials and get most features running pretty smoothly... I got a teensy audio i2s streaming over SBC from a source to a sink and back to another teensy out a dac in a few hours with the help of the tutorials (less the i2s configuration setup). I give the product a 3 star because of lack of documentation, but 4 stars because sparkfun made up for the lack of it. Thanks sparkfun! However if you want full functionality, you'll need to dig through CSR website (Qualcomm just bought CSR the bluetooth chip maker) and Sierra Wireless's forum (bought out Blue Creation who developed the software) to get information on how to upgrade and unlock other advanced functions. The chips I received have melody 5, which doesn't have aptx low latency codec's installed; so I need to upgrade the firmware on the device. If you want to go down this path, you'll need to get the CSR SPI programmer or figure out a way to program the *.dfu files over uart/usb. As of this review, CSR still contains the Bluesuite software you need to perform this operation, but due to being bought out by Qualcomm, these files may disappear to somewhere else soon. Also note that Sparkfun will guarantee absolutely nothing or provide any support if you upgrade the unit to the new Melody firmware. You will not find the upgrade software on google as some forums or datasheets mention "BC127 upgrade tool" which has been removed from servers because of a legal dispute about the code contained in the utility; you must go to CSR/Qualcomm and install bluesuite which contains the DFU wizard tool you need to perform this.